nice that you'r looking at our site, with this website we hope to convince you to visit us. Get away from it all, back to basics, surrounded by nature, a bit of time for yourself, on your own or with your family. 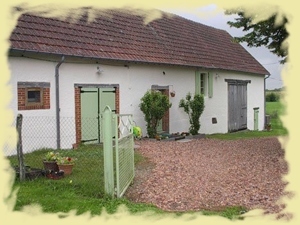 Come and enjoy the spaciousness and the peace and quiet of Burgundy. A little homely campsite with 6 pitches on 4000 square meters: ideal for anyone looking for peace and quiet. We offer you the possibility to rent a 2/3 person caravan, a (new) chalet for 4 persons, or a small trekkers chalet for 2 persons, if you come with your own camping means you will be very satisfied with the spacious pitches on our mini camping. Our campsite is located 8 km outside Decize, where there are regular activities and where there is a little farmer's market every Friday morning and a big market every third Tuesday in the month. Decize has 4 supermarkets and also a district hospital. Our little campsite offers you a relaxed atmosphere and large, non-demarcated camping pitches on two very lightly sloping fields separated by a little ditch. The campsite is surrounded by meadows in which cows and sheep graze. You can also spot wild animals, such as foxes and deer in the meadows around the campsite. You can set off on fantastic walks and cycle tours in the very quiet surroundings of the local area directly from the campsite. ³You can use the campsite as a starting point or destination for your cycling tour and leave your car on the campsite for the duration. There are many different bird species, such as hoopoes, kingfishers, grey herons, little owls, tawny owls, buzzards, kestrels and storks, to be seen here. If you are looking for an activity holiday, there is plenty to choose from in the area: walking, cycling, canoeing, city sightseeing, Magny-Cours Circuit, you name it... If you just want to relax and do absolutely nothing, you will particularly appreciate the peace and quiet. If you want to, you can enjoy playing the Frenchman's favourite game: jeu de boules. You don't have any boules? Don't worry, we have them here at the campsite. In the recreation room you can play table tennis and there is a dartboard hanging on the wall for dart aficionados (bats, balls and darts are all available). Whether you want an active or a relaxing holiday, this is just the right place. If we are not there when you arrive, you can choose yourself where you want to camp - in the sun or in the shade; the pitches are not demarcated. We hope you enjoy preparing your holiday and perhaps we will be able to welcome you to our little campsite sometime soon either in the facilities that we hire out or in your own. Due to the renovation of the house, at present, the recreation room is not available. • A beautiful site and a very friendly welcome. • Hospitality, lovely surroundings and peace and quiet. • Fantastic and friendly, unique surroundings. • Lovely rural location and wonderfully quiet. 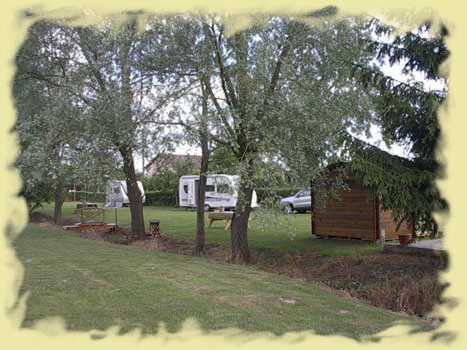 • La Prise campsite is ideal for cyclists and for anyone who loves their peace and quiet. • For the first time a campsite which is exactly as they show on their website, tranquility, space, a surprise!